Editor's Note: As of the last update to this page in September of 2007, it is hoped that the EXTREME FORCE of the call to action represented by RMT will NEVER be needed again. However, knowing it is available, is a comfort to true Angels' fans. When should RM Time be used? 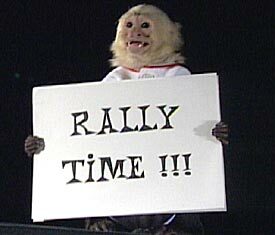 The 7th inning and later when the Angels are trailing... Rally Monkey Time!